Not even cancer letters are immune from colouring! I had pretty much deduced that I was going to be told I had cancer that day. I just knew. It didn't make hearing the word any easier. The feeling of that moment was shockingly surreal - nothing dramatic, just numbing and totally life changing. I could still take in what the consultant was saying and follow the conversation, until she said 'Chemotherapy'. That was when I had to interject to clarify my worst thoughts; that this was actually really serious! 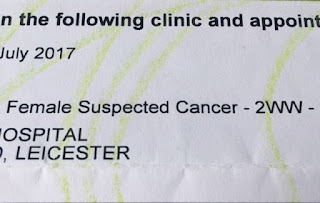 My consultant brushed this off with casual, collected prowess - she made it sound so normal and was totally confident that they could get rid of the cancer and operate on me within 6 months. I'm not ashamed to say that by this point everything had started going fuzzy, I felt sick and feared an embarrassing situation was approaching. I asked to lie down, but it didn't help - it merely bought me enough time to ask for a cardboard bowl just in time to catch the contents of my stomach. My consultant still cool as a cucumber thought it best to take a break and sent me to have a mammogram before discussing my treatment any further. Having a mammogram is painless: stand upright with your baps out and be sandwiched between vice-like plates for some indepth photos of your breasts - easy...just not so much when you're in shock. It was when in my final 'mammo-pose' when I felt the undeniable urge and need to sit down; next thing I know I'm horizontal, back to the floor and awaking from my first ever faint! In true British style my first thought was to apologise to the nurse who had caught me and saved me from a swift bang to the head..."they just told me I have cancer, I'm sorry to put you out like this - I've never fainted before". It was then that I saw my first 'cancer' face - the expression of shock, sadness and speechlessness all rolled into one. Before that day I'd only been in hospital to have my children - I'd never been 'ill', so this was a pretty eventful afternoon for me; it just didn't end with the endorphins having a new baby to show off brings. 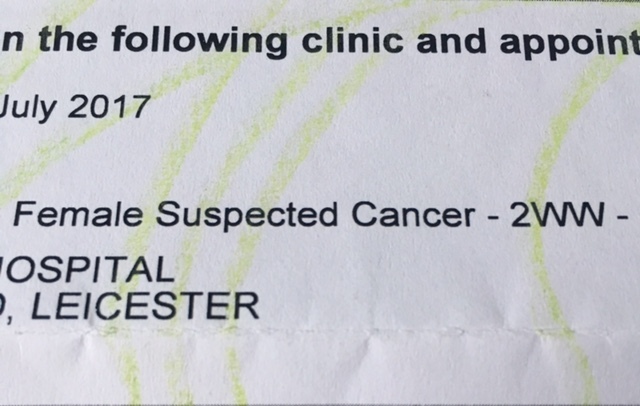 To say it didn't go as expected is an understatement; what I thought would be confirmation of a little bit of cancer that would require a quickie operation and a few days off work had quickly snowballed into something that just doesn't happen to you. 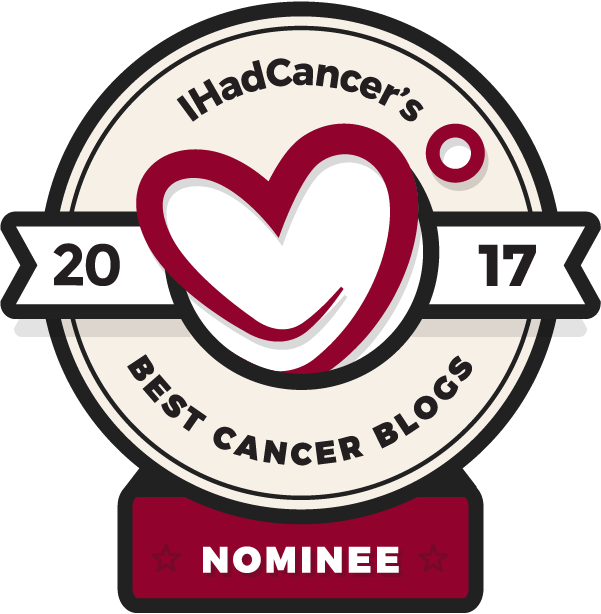 I can't have cancer! I have 2 children, I'm really enjoying being back at work - I have plans, I don't have time for this! None of that matters now, its all been stripped back and its simple - I must get well and rid my body of this disease. A new chapter begins and I'd really like to keep it as short and sweet as possible! Hello lovely. Reach out to people around you and ask for support. Maybe, just maybe, parts of the cancer experience will lift you up. Although nothing makes 'cancer face' easier!